In vivo dosimetry directly monitors the radiation dose delivered to a patient during radiation therapy. It allows comparison of prescribed and delivered doses and thus provides a level of radiotherapy quality assurance that supple- ments port films and computational double checks. A well-devised in vivo dosimetry program provides additional safeguards without significantly extend- ing treatment delivery time. A variety of detectors, including thermoluminescent dosimeters (TLD), sili- con diodes, and new detectors such as metal oxide silicon field-effect transisters (MOSFETs) are currently available for in vivo dosimetry. Diodes have gained in popularity since the 1980s because they are rugged, relatively inexpensive, and provide online readings for prompt point-dose inference compared to the offline and lengthy annealing process required with TLD. This real-time in vivo dosimetry allows for immediate investigation and correction of errors encountered during dose delivery. While many diode systems are marketed as ready plug-and-play for clinical use, medical physics understanding is required for users to accurately and effectively infer delivered doses from diode readings. Task Group 62 (TG-62) was formed to provide physics information, advice, and guidelines to assist clinical physicists in performing reliable in vivo dose verification using diodes. 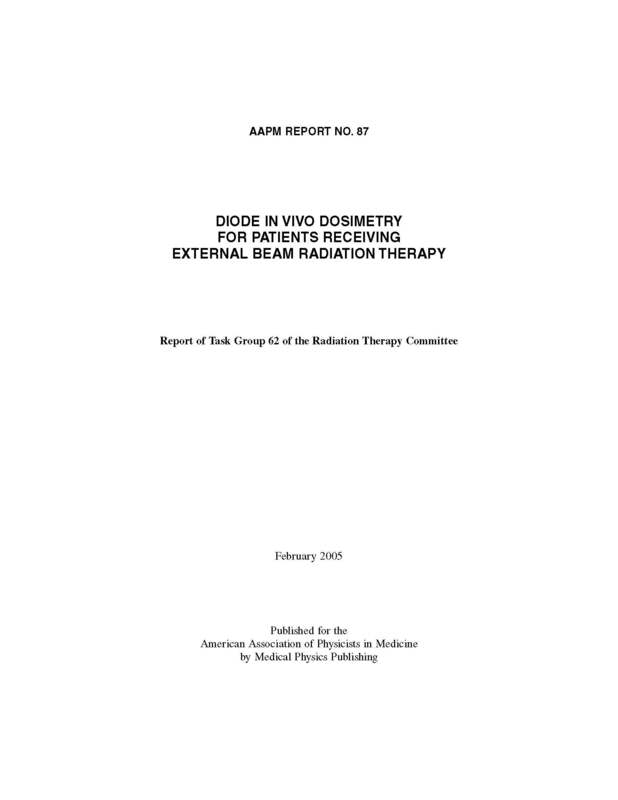 This report provides some basic solid-state physics and electrometer concepts essen- tial to understanding the diode as a dosimeter; describes practical acceptance tests, calibration, and correction methods for commissioning a diode in vivo dosimetry system; and suggests methods of inferring doses to patients undergoing static photon and electron beam radiation therapy. It also discusses considerations that can assist physicists in making new purchases or in implementing a clinical diode in vivo dosimetry program.